If you are building an Outlook Group Connector that you are spending a lot of time writing JSON message & specifying different schema elements and attributes to be able to build a canvas that looks like this below figure, so i got good news for you! I got your back and published an Outlook Group Connector SDK ver. 1.1 nuget package that includes tons of extension methods and features that helps your easily build your JSON payload message. 1) GitHub Repo for SDK and Samples apps including console & web apps (link). 2) NuGet package that has been published to use it in your apps (link) or search for "Office365ConnectorSDK" in VS 2015. Office 365 Connectors provide a compelling extensibility solution for developers. Developers can build connectors through incoming webhooks to generate rich connector cards. Additionally, with the new "Connect to Office 365" button, developers can embed the button on their site and enable users to connect to Office 365 groups. I have built this application that demonstrates outlook connector integration showcase that includes an integration for "Connect to Office 365" button into a third party website and how to send a detailed canvas message to a group. Outlook Connector landing page: Click on "Enterprise" menu item, install our connector into one of your office 365 groups. Send a message to any group: Click on "Send Message" menu item, set a title message and group name and click on Send button. Check your group and you will be notified with a full detailed canvas message. A general overview of what Office 365 Connectors are and how end-users interact with them. Complete documentation for building Office 365 Connectors. A sandbox environment for developer experimentation. Create and manage outlook connector settings in this dashboard. 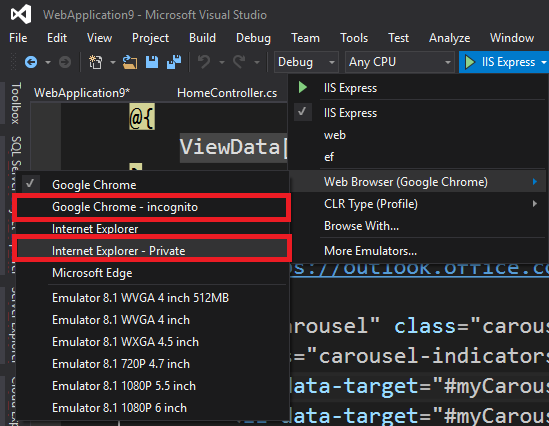 I'd like to share a cool tip when running web applications in Visual Studio by opening your web browsers in private mode if you are using Internet Explorer or incognito mode if you are using chrome. This is a needed practice especially if you are sharing different logins using the same browser and you want to avoid cached logins issues. 1) From any html or View page in Visual Studio, right click and click on Browser with. 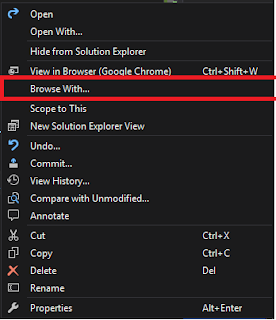 2) Click on Add button to add IE in private mode. 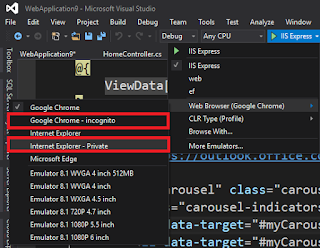 Now, you will be able to run web applications in browsers' private mode in Visual Studio 2015.